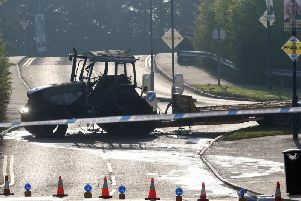 The burglary and arson attack took place in the Thornleigh Park area between the hours of 6.30am and 7am on Sunday. A number of items were removed from the victim’s garage before being set alight in her back garden. If anyone noticed any suspicious activity in the area that morning they would ask that you contact the police on 101 or ring the Crimestoppers charity on 0800-555111.